Penryn is possibly one of the oldest towns in Cornwall and is steeped with character and history. Located on a hill with spectacular views overlooking Falmouth and the Carrick Roads, it is one of the best kept secrets of the area, although the news is spreading! The town centre is dominated by a clock tower which is surrounded by shops, cafes, art galleries and local amenities including two banks and a Post Office. Penryn is only a ten minute walk from Bay View, here you will find a train station where trains run to Falmouth and Truro every thirty minutes. There is also a bus stop within a ten minute walk where you can catch busses to Falmouth or Truro. Take a stroll around Penryn and you will be able to cater for most things in the local area. The Little Yellow House - Enjoy a coffee at this delightful shop whilst you browse the eclectic mix of gifts. Recently featured in the Easy Living Magazine as one of Britain's most unusual and stylish shops. Earth & Water Health Food - Relax for a bite to eat and drink at Penryn's healthiest shop whilst you stock up on food supplies! All your normal delicatessan produce with a few ones you may not have seen before. Try one of the delicious Organic Pasties or some locally brewed ale. Our recommendations are the Sweet Potatoe Pasty and Earth & Water's own brand Organic Pale Ale. Cheers! Malcolm Sutcliffe Glass Gallery - Internationally renouned one-off glass gifts are made and displayed in this gallery in Penryn. Have a go at blowing some glass yourself in one of their work shops or watch the master at work. Please visit the website for details. The Cornish Smokehouse - Hailed by celebrity chef Rick Stein as a 'superhero' this family run business has a tiny visitor shop just a stone's throw from Prospect House. Ideal for purchasing delectable pre-dinner nibbles or help make that picnic lunch one to remember. Seabourne Fish - Next door to the smoke house is the friendliest fish shop in the South West! Why not stock up on fresh fish before you head back home. Number 20 Bar - If you are looking for live music in a relaxed setting, then the Number 20 Bar on Lower Market Street may be for you. With a wide range of drinks from around the world, quiz nights on a Wednesday and live DJs playing on Saturday nights, this cosy bar is perfect for both intimate drinks with friends or entertaining nights out. Miss Peapod's Cafe - On the water's edge at Jubilee Wharf you will find Miss Peapods Cafe which provides an eclectic mix of contemporay and retro style decor and delicious foods. Family friendly dining is provided with an area set aside for the children to play. As one of Cornwall's most ancient towns, founded in 1216, Penryn really is steeped in tradition and history. From its position at the head of the Penryn River, the town thrived during medieval times as a port and trading point for Cornish fish, tin and copper. Unfortunately for Penryn, it lost it's custom house and market rights to the nearby town of Falmouth in the 17th century, which initiated the continuing growth of Falmouth and led to the decline of the once thriving Penryn. Today, Penryn is a bustling town that has managed to retain an enormous amount of its rich heritage. 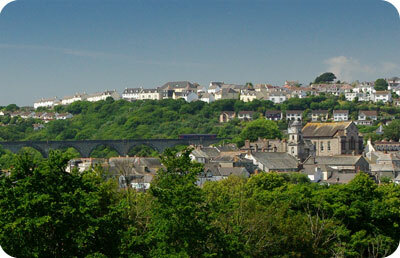 A large proportion of its town centre buildings date back to Tudor, Jacobean and Georgian times and the town itself is an important conservation area and has more listed buildings than any other town in Cornwall. One recent and influential editions to Penryn, is the building in 2004 of the Combined Universities in Cornwall's Tremough Campus, which overlooks the town from its hillside position. This campus, built on a 70 acre site which was once home to a convent school, houses three separate university institutions - the University of Exeter, University College Falmouth and the Dartington College of Arts. The student halls on campus are home to over 2000 students. In the last 5 years, due in part to the increased investment and economic stability brought about by the expansion of Tremough campus, Penryn has experienced an influx of revitalisation and regeneration. One prime example of this is the development of Jubilee Wharf. Jubilee Wharf is an award winning development which sits at the head of the Penryn River. It encompasses a mixture of housing, workshops, offices and a children's nursery. Built using pioneering techniques of eco-development, and designed by Bill Dunster it has helped create a unique and eyecatching development in the town. Take a stroll around it and you will be delighted by the location and the interesting mix of shops and cafe.